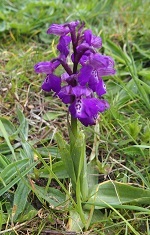 A Green-winged Orchid was found on Ely Common 19th April 2017. It is thought that this might have been introduced via hay from Chettisham Meadow which was donated by the Wildlife Trust together with wildflower seeds. Easter Sunday brought a lovely surprise to Ely. 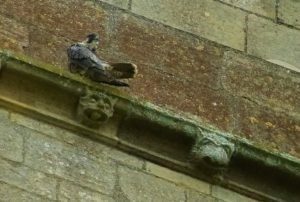 Perched on the cathedral – at the top of the northern face of the main tower (ie visible from the old library) was a peregrine falcon. Although it looked quite settled there’s not the tell tale lime splatter to suggest that it’s been there regularly. Fingers crossed though that they find Ely suitable and the Cathedral prime real estate and set up residence. Wouldn’t it be wonderful to have breeding peregrines. Seventy-six taxa were recorded from various habitats at Roswell Pits. 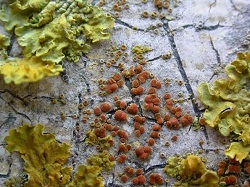 Three of these are lichenicolous fungi; an under-recorded group of organisms that infect lichens. One of these, Pyrenochaeta xanthoriae was added to the British list in May 2016 and the occurrence at Roswell Pits is new to Cambridgeshire and the third record for Britain. The most notable lichen community occurs on the trunks of old stubby trees on the bank beside Springhead Lane. 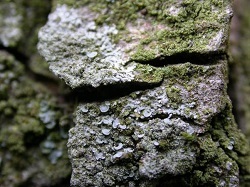 A particularly notable example of this community occurs at TL5521.8050 where Bacidia viridifarinosa forms extensive pale green sorediate patches at the bases of the trunks. B. viridifarinosa is known from just one other site in Cambridgeshire, in Madingley Wood.